MANILA, Philippines – Civil society groups said the Aquino government must improve its adaptation and mitigation efforts, not only in the aftermath of Typhoon Yolanda, but also given the dire warnings cited in the recent United Nations climate report on climate change. At a press conference today, Aksyon Klima Pilipinas, Greenpeace and Oxfam expressed their grave concerns following the Intergovernmental Panel on Climate Change (IPCC)’s Working Group II Report on Impacts, Vulnerability and Adaptation, which released a grim climate forecast for Southeast Asia. The IPCC report was the consolidated work of thousands of scientists and affirmed by world governments. The three civil society groups urged the Aquino government to take the first step by allocating funds for the People’s Survival Fund (PSF), which by law should finance the adaptation plans of local government units (LGUs). Adaptation plans include setting up early warning systems and contingency planning for extreme weather events such as droughts and floods. The organizations emphasized that they continue to call on governments across the world, particularly developed countries, to honor their responsibility and commit to scale up their adaptation and mitigation actions. “But after Yolanda, we also need to adapt to the best of our own abilities and empower communities so they can be more climate-resilient,” the three groups stated. “Beyond the PSF, both disaster risk reduction and climate change adaptation should already be incorporated in the post-Yolanda rehabilitation plan, and then into longer-term national and local development plans and budgets,” according to Melvin Purzuelo, convenor of Aksyon Klima Pilipinas. “As a highly vulnerable country, extreme weather events are now our new normal, and we need to take concrete measures to literally survive,” the groups added. MAKATI – Green groups and civil society organizations gathered today at the Canadian Embassy to call for the “re-exportation” of their toxic wastes which were discovered by the Enforcement Department of the Bureau of Customs (BOC) headed by Deputy Commissioner Ariel Nepomuceno last January and initially intended as plastic scraps supposedly for recycling. The groups delivered a petition letter to Canadian Ambassador Neil Reeder to ask for the immediate return of the 50 container vans of toxic wastes back to its Canadian port of origin. Composed of ANG NARS Party-List, Greenpeace, Ecowaste Coalition, Mother Earth Foundation, Green Convergence, Ban Toxics, Public Services Labor Independent Confederation and the Ateneo School of Government, the groups expressed their dismay at the inaction by the Canadian government and demanded that the shipment firm Chronic Incorporated, and its Philippine consignee Chronic Plastics, return the hazardous shipment back to Canada at their expense. “These toxic wastes pose imminent risks, threats and hazards to our environment, which in turn, result to irreparable damage on the health of the Filipinos. So we demand for the re-exportation of these Canadian wastes immediately,” said Rep. Leah Paquiz of ANG NARS Party-List. According to the BOC, the shipment, which started arriving as early as June 2013, contained mixed waste composed of plastic bags, bottles, newspaper, household garbage, and even used adult diaper. “The Philippines is not and will never be a dumping ground for international wastes. We ask that Ambassador Reeder to cooperate and help expedite the return of their toxic waste that have been ‘overstaying’ in our shores since June,” said Abigail Aguilar, Toxics Campaigner of Greenpeace Philippines. Greenpeace said that the toxic shipment was a clear violation of the Basel Convention on the Transboundary Movement of Hazardous Wastes, an international treaty, to which both the Philippines and Canada are signatories, designed to eliminate the movements of hazardous waste between nations, and specifically intends to protect developing nations from becoming the dumping ground of industrialized countries. The Canadian shipment also violated Republic Act 6969 (Toxic Substances and Hazardous and Nuclear Wastes Control Act of 1990). MANILA – The Department of the Interior and Local Government (DILG) has urged all local government units (LGUs) to ensure that the principles of Republic Act 9710 or the Magna Carta of Women (MCW), which is considered as the “Bill of Rights” of Filipino women, are mainstreamed at the local level. DILG Undersecretary for Local Government Austere Panadero, who is also the concurrent Gender and Development Focal Point (GAD-FP) Chairperson of the Department, said all LGUs must comply with the requirements of the said law through the creation of an enabling environment that will promote women’s empowerment, gender equality and ensure gender responsive governance at the local level. This after the DILG, Philippine Commission on Women (PCW), Department of Budget and Management (DBM), and National Economic and Development Authority (NEDA) recently issued a joint Memorandum Circular to all provincial governors, city and municipal mayors, punong barangays, members of the local sanggunians, DILG Regional Directors, and all other concerned on the guidelines on the localization of the Magna Carta of Women. “The MCW provides that local governments are tasked to promote and ensure that GAD is mainstreamed in the local policy-making, planning, programming, budgeting, implementation, monitoring, and evaluation,” Panadero said. Under the joint memo circular, the local chief executives are directed to ensure that their GAD Focal Point System or similar GAD mechanisms are in place, fully-functional and its members have the capacity to promote gender mainstreaming pursuant to Sec. 37 of the MCW Implementing Rules and Regulations (IRR). Panadero said the DILG, through its Bureau of Local Government Development (BLGD), will conduct a series of training programs on gender mainstreaming for DILG Provincial GAD coordinators and Provincial Grassroot Budgeting Focal Persons all over the country from April to May, this year. He said the workshops in six batches (three in Luzon, one in Visayas, and two clusters in Mindanao) will enable the participants to coach and mentor LGUs on their implementation and compliance to MCW on the following mechanisms: 1) preparation of GAD plan and budget, monitoring and evaluation system; 2) formulation of GAD Code; 3) establishment of GAD database; 4) creation and/or strengthening of the GAD Focal Point; and 5) mainstreaming gender in local development plans. The 1st batch of participants will be from Regions 6, 7 and 8 to be held in Cebu City on April 22-24, 2014; 2nd batch from Regions 9, 11 and ARMM in Davao City on April 28-30, 2014; and 3rd batch from Regions 10, 11, 12, and 13 to be held in General Santos City on May 6-8, 2014. Likewise, the training of the 4th batch from Regions 4A and NCR will be held in Metro Manila on May 13-15, 2014; 5th batch composed Regions 4B and 5 will also be held in Metro Manila on May 20-24, 2014; and lastly, the 6th batch from Regions 1, 2, 3 and CAR to be held in Baguio City on May 27-29, 2014. “All of these activities are ultimately aimed at educating and building the competencies of our local government officials and their GAD focal persons on effective gender mainstreaming as a strategy to eliminate gender discrimination in government systems, structures, policies, programs, processes and procedures as mandated by the MCW,” said Panadero. MANILA – Further strengthening its commitment to contribute to post-Typhoon Yolanda (Haiyan) recovery efforts, Cargill Philippines has entered into an P11 million partnership with Philippine Business for Social Progress (PBSP) designed to rehabilitate coconut farming communities in parts of Leyte province. The program will be replicated in other areas of Eastern Visayas. The initiative, which will be rolled out in Barangay Inangatan, Tabango, Leyte and other nearby areas, aims to help address damages caused last year by the super typhoon on agricultural production in Eastern Visayas, considered to be the country’s second highest coconut producing region. Cargill Philippines and PBSP will be implementing the project in collaboration with the Philippine Coconut Authority, the Department of Agriculture, Visayas State University - Villlaba Campus and the local government of Tabango, Leyte. “We recognize the need for a long-term, holistic, and sustainable program in order to truly make an impact in the lives of those affected by super typhoon Yolanda (Haiyan),” remarked Philip Soliven, President of Cargill Philippines. As part of its objectives, the initiative will establish a coconut nursery for the propagation of seedlings. The facility is expected to supply 70,000 seedlings a year for long-term coconut rehabilitation in the municipality and surrounding areas. The project also aims to rehabilitate coconut farms in the area. In the second semester of 2014, 150 hectares will be planted with a fast growing coconut variety and intercropped with corn as a short-term gestating crop. This will be rolled over three more times at 150 hectares per cycle until the middle of 2016, to achieve a cumulative reach of 600 hectares over two years. Two 5,000 square-meter demonstration farms will also be established at two different sites to promote cash crop production as a source of income and food for the farmers while waiting for the coconut trees to bear fruit. The demonstration farms will showcase appropriate integrated farming systems technologies such as vegetable production, fish farming, and backyard poultry and livestock raising, among others. Apart from these, coconut farmers will also receive training on Integrated Farming Systems from PBSP’s Center for Rural Technology Development (CRTD). The expected 400 farmer-beneficiaries will also be organized into a farmers’ association whose leaders will also receive development, financial management, and project management training, among others, in order to ensure the sustainability of the program. “We greatly applaud the efforts of Cargill Philippines, one of PBSP’s newest members, in heeding the call to support those affected by super typhoon Yolanda,” said Rene Fortuno, Director for Livelihood and Enterprise Development Program of PBSP, which will monitor the implementation of project activities and submit quarterly reports on the status of the project. Reflecting its focus on sustainability, the project is designed to eventually allow the development of an inclusive business model for Cargill Philippines that may involve, but is not limited to, the sourcing of coconut materials as well as other produce from the initiative’s intercrop/cash crop selection for use in its primary product processing operations. It is also envisioned to successfully link Cargill’s core coconut business to efforts aimed at reducing poverty among coconut farmers. Previously, Cargill raised around US $500,000 in cash donations to aid the survivors of super typhoon Haiyan, partnering with the UN World Food Program for initial immediate relief works to ensure the survival of the victims and with the PSBP to deliver life-saving and early recovery assistance, including food and comfort packs, and provide for shelter repair kits to help mend damaged houses in affected areas. YOKOHAMA, Japan – Greenpeace urged world leaders to accelerate the transition to clean and safe energy as the UN climate panel issued on Monday a new warning on the looming climate chaos. The Intergovernmental Panel on Climate Change (IPCC) said climate change impacts are already widespread across all continents and oceans and rapidly worsening. How bad it will get hinges on near-term choices. "We’re walking a tightrope, but if we act boldly and cut climate pollution faster major threats to human security can still be avoided and vital ocean systems, forests and species protected. Our actions will define how history will judge us and we question world leaders: will you stand with us?" said Kaisa Kosonen at Greenpeace International. The IPCC report found that climate change is a growing threat to human security, as it exacerbates food and water vulnerabilities and indirectly increases the risks of migration and violent conflicts. "Oil rigs and coal power plants are weapons of mass destruction, loading the atmosphere with destructive carbon emissions that don't respect national borders. To protect our peace and security, we must disarm them and accelerate the transition to clean and safe renewable energy that’s already started," said Jen Maman, Peace Adviser at Greenpeace International. The issue of economic impacts, where estimations vary wildly, has also grabbed attention, but for vulnerable regions losses caused by climate change cannot be valued in terms of GDP alone. "Let’s not get distracted by limited economic models or be blinded by global GDP. What value can you put on the lives of 8,000 people left dead or missing by typhoon Haiyan? Or what is the cost of the trauma of children being torn from their mother's arms due to storm surges? That is the true cost of climate change that should define the urgency of the action we take," said Amalie Obusan, Regional Climate and Energy Campaigner at Greenpeace Southeast Asia and based in the Philippines. "Today it's the victims who are paying the costs of climate change while polluters are going free. Oil, coal and gas companies are earning huge profits but not being held liable for the damage they are causing. This has got to change and we are determined to change it." Greenpeace demands governments to come to the climate summit of UN Secretary-General Ban Ki-moon in September with serious offers that will help achieve a 100% renewable energy system. Solar, wind and other clean energy are already challenging our old system, but governments must accelerate the transition. PASAY CITY – Senator Chiz Escudero has filed a bill amending the Electric Power Industry Reform Act (EPIRA) to bolster government control over all existing and future assets of the National Power Corporation (Napocor)) in order to temper the profit-oriented practices in the sector. Escudero, chairman of the Senate Finance Committee, put forward Senate Bill No. 2167 (S.B. 2167) to amend Section 47 of Republic Act No. 9136 or the EPIRA law, and place all remaining assets of Napocor under government. Escudero, who voted against EPIRA when he was still in Congress, said the law failed to deliver its promise to solve the country’s perennial energy woes. “The EPIRA became a misnomer to its purpose. Instead of reforming the business environment to better service and improve delivery of supply and lower rates to consumers as it was hoped then, it has caused the government to lose control of the power industry,” Escudero lamented, as he noted that the Philippines has one of the highest power rates in Asia. S.B. 2167 also seeks to exclude the Agus and Pulangi complexes in Mindanao from privatization since these hydropower plants supply half of the energy demands in Mindanao. “We should endeavor to rehabilitate these two resources in order to stabilize the market situation in Mindanao as hydropower is still the cheapest. Monopoly in Mindanao will also be cut,” Escudero pointed out. According to Escudero, all existing and future power assets, especially from hydro resources, must be retained, rehabilitated, maintained and developed. The bill provides that in case of transfer of possession, control, operation or privatization of multi-purpose hydropower facilities, the control and power of the government must always be empowered to direct water usage in all cases it may deem appropriate to satisfy all water requirements imbued with public interest. Escudero’s bill also presses for the development of geothermal resources in the country and construction of new geothermal plants and that steamfield assets and generating plants of each existing geothermal complex should not be privatized. “Unless we institute policy reforms through amending the failures in EPIRA, it will be difficult to maintain control of the power industry by the government and make it service-oriented. We must put an intervening mechanism to temper the operation of free market forces especially in cases of monopolies and/or abuse to protect greater public interest,” Escudero said. Peace and Order Councils of 3 Samar towns declare their towns as "Peaceful and Development Ready Municipalities"
CAMP LUKBAN, Catbalogan City, Samar – Peace and order councils of three towns of Samar Province declare their towns as Peaceful and Development Ready Municipalities in a joint signing of declaration held at Marju Krishel Hotel, Calbayog City. The towns of Tagapul-an, Sto. Niño and Almagro all of Samar were declared by the peace and order councils of said municipalities headed by their town mayors as peaceful and development ready. The joint signing and declaration of said towns was made possible after the towns met the parameters stipulated under National Internal Peace and Security Plan, namely: different threat groups failed to function as organized insurgent movement; there is minimal threat to stability, peace and order and development, as well as transgression of laws; no established support system for threat groups; effort to infiltrate unaffected areas and sectoral organizations has been prevented; and the arouse, organize, mobilize (AOM) and Ideological, Political and Organizational were thwarted and prevented. These mean that rebel activities need minimal military interventions as it can be easily addressed by the PNP troops in said municipalities. The declaration was attended by Hon Kathleen S. Prudenciado, Mayor of Almagro, Samar; Hon. Lilia A. Coñejos, Mayor of Sto. Niño, Samar; Hon.Vicente F. Limpiado Sr., Mayor of Tagapul-an, Samar and Ms Luz D. Tacal of Samar PSWDO, representing Hon. Sharee Ann T. Tan, Governor of Samar. It was also attended by Maj Gen Jet B Velarmino AFP, the Commander of 8th Infantry Division, Col Wilson B. Leyva, the Commander of 801st Brigade, Philippine Army and Lt Col Glen C. Calambuhay, the Commanding Officer of 43rd Infantry Battalion. While Philippine National Police was represented by Chief Inspector Felipe R. Tan, Chief, Police Community Relation, Samar Provincial Police Office. The declaration of the three towns as peaceful communities and ready for development symbolizes that a new era of peace and progress has started in Samar Province. That rebellion is a thing of the past and no longer the craze or fad of the masses. This also indicates that the 8th Infantry Division is still on the running to meet its target for the whole Samar Province to be declared as Peaceful and Development Ready comes June 2014. In her message, Hon Lilia A. Conejos, Mayor of Almagro, Samar said: "There were so many violence in my town in the past, people got killed because they do not give in to the extortion demands of the NPA rebels. I thank the military for helping us to move on and cleansed our town of NPA rebels and help us realized our dream of a having a peaceful community to live on." Maj Gen Jet B. Velarmino AFP, the Commander of the 8th Infantry Division said: The Joint Declaration of the municipalities of Almagro, Sto. 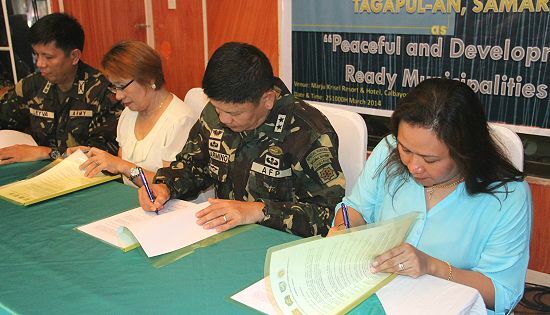 Niño and Tagpul-an of Samar Province as 'Peaceful and Development Ready Municipalities' shows that the spirit of Bayanihan is strong among the Army, the Local Government Units and other stakeholders in these municipalities." "We are very happy to be part of this endeavor and we can proudly say that we are moving towards the right direction. Together, we are sending a strong message that these municipalities believe that it is through peace and development efforts, and not armed struggle, that we can achieve a sustainable development and a just and lasting peace in this part of Samar Province," he added. QUEZON CITY – “Mukhang pinagkakakitaan pa ng gobyerno at militar ang iligal na pag-aresto at pagdukot ng mga peace consultants, mga aktibista at ordinaryong sibilyan,” said Karapatan secretary general Cristina Palabay on the 10-million peso bounty each for the arrest of Benito Tiamzon and Wilma Austria. “The Aquino government’s practice of criminalizing political acts to cover up the illegal arrests of peace consultants, activists and civilians is legitimized by the highly questionable Joint memorandum 2012-14 of the Department of National Defense and of Interior and Local Government,” added Palabay. Karapatan called the reward system as ‘one-time, big-time’ organized racket of the DILG and the DND and the list, a “secret hit list” akin to Gloria Arroyo’s Order of Battle. The said hit-list carries the name of 236 alleged communist leaders with total reward money of P426 million for their capture. It was the same list that legitimized the illegal arrest, torture and detention of security guard Rolly Panesa, whom the military alleged CPP-NPA leader “Benjamin Mendoza” for P5.6 million. The money was awarded by the AFP to an unidentified person. The same violation, Karapatan said, was committed against Oligario Sebas, a farmer from Manjuyod, Negros Oriental, who was also jailed because the AFP’s claimed he was “Felimon Mendrez”, allegedly a CPP leader in Negros.” The AFP said Sebas had a P5.2 million bounty on his head and was on the said list. Also, the said DND-DILG Joint Order was used to legitimize the enforced disappearance, illegal arrest, and detention of Estelita T. Tacalan, a 60-year old peasant organizer and rural health worker in Misamis Oriental. Tacalan was reported missing on April 27, 2013 and was surfaced more than a week later at the Dipolog City Jail. Tiamzon and Austria, with P10million each for their capture are in the said list, among other detained and missing peace consultants. “The reward/bounty system is dangerous because it can be used to justify the victimization of any person so the military and police may get the reward money," Palabay said. Karapatan called for the scrapping of the DND-DILG’s secret hitlist saying the “AFP should also be held accountable for squandering the people’s money to violate people rights”. QUEZON CITY – The March 3 order by the Energy Regulatory Commission (ERC) to recompute the generation price at the Wholesale Electricity Spot Market (WESM) for November and December 2013 for purposes of determining the Meralco tariffs clearly found evidence of market abuse, manipulation and collusion by many of the power industry players, the Trade Union Congress of the Philippines (TUCP) said yesterday. Last week, PEMC came up with rates increase computation of P2.43/kwh and P3.02/kwh for the two billing periods and said that the final computation still depends on Meralco. This was later disputed by ERC, showing that the increase should only be P0.33/kwh to P0.43/kwh. Seno said it is important for ERC to redeem its 12-year inutility as a regulatory body by naming and prosecuting who gamed the Wholesale Electricity Spot Market (WESM) and who colluded against public interest. “They are the same con men in the guise of Independent Power Producers investors who have made our power rates the third highest in the world. ERC exercises police powers but found no one to hold accountable. This is not the ‘Tuwid Na Daan’ but political accommodation. Command responsibility rest in the hands of Ms. Ducut,” Seno stressed. The ERC on March 3, 2014 denied the petition of Meralco to increase its pass-through generation charge by P4.15/kwh and P5.33/kwh for December 2013 and January 2014 billings respectively because of evidence of alleged gaming at the Wholesale Electricity Spot Market (WESM). He also noted ERC regulatory rulings and calculations of allowable rate are regarded by Philippine Electricity Market Corporation (PEMC) and Meralco merely as suggestion and not mandatory.